In the last decade, St. Johns County was one of the fastest growing areas in the country. With that growth an added burden has been placed on our water supply and recreational waterways. Our whole community must do their part to ensure that our area’s growth does not result in pollution of the local waterways. Stormwater is the flow of water that results from a rainfall. Stormwater runoff occurs when precipitation flows over impervious services like driveways, sidewalks, and roads, picking up oil, grease and other surface pollutants. The stormwater flows from streets and gutters into our rivers, lakes and coastal waters inhabited by fish, frogs, and other aquatic animals and plants. When the polluted stormwater reaches our waterways, it has many long-lasting negative effects on aquatic plant and animal life. This pollution also impacts other species that use the water, including humans. Application of BMPs at County facilities. The Watershed Protection Program (WPP) provides storm water pollution education and information opportunities for schools, homeowner associations, and other groups, organizations and events through the interactive Watershed Pollution EnviroScape model. Our program managers will come to your school, meeting or event and demonstrate the local impacts of stormwater pollution on our county's water resources. Contact Cheryl McCrory at (904) 501-5600 or sjcwpp@comcast.net for information and scheduling. Staff assists the public concerning complaints or questions regarding County reviewed projects, as well as ensure compliance with mitigation and monitoring requirements. Staff also coordinates and negotiates with the St. Johns River Water Management District (SJRWMD), Florida Department of Environmental Protection (FDEP), and other regulatory agencies for permitting. Stormwater pollution is caused by the daily activities of people everywhere. Rainwater run off from streets, lawns, farms, and construction and industrial sites and pick up fertilizers, dirt, pesticides, oil and grease, and many other pollutants on the way to our rivers, lakes, and coastal waters. Stormwater runoff is our most common cause of water pollution. As storm water flows over driveways, lawns, and sidewalks, it picks up debris, chemicals, dirt, and other pollutants. 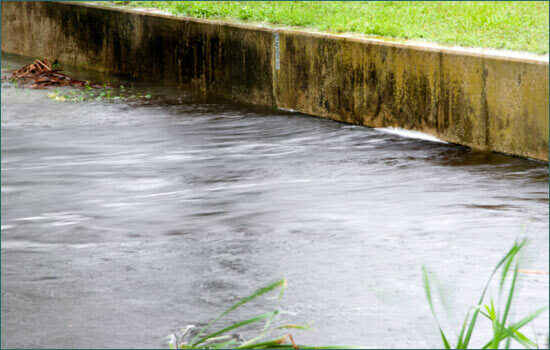 Storm water can flow into a storm sewer system or directly to a lake, stream, river, wetland, or coastal water. Anything that enters a storm sewer system is discharged untreated into the water bodies we use for swimming, fishing, and providing drinking water. Polluted runoff is the nation’s greatest threat to clean water. By practicing healthy household habits, homeowners can keep common pollutants like pesticides, pet waste, grass clippings, and automotive fluids off the ground and out of Stormwater. Adopt these healthy household habits and help protect lakes, streams, rivers, wetlands, and coastal waters. Please view Best Management Practices and the Stormwater section to access more information and resources. Remember to share the healthy household habits with your neighbors!